This section provides an architectural overview of MySQL Cluster Manager, its components, and their deployment. MySQL Cluster Manager is a distributed client-server application consisting of two main components. The MySQL Cluster Manager agent is a set of one or more agent processes that manage MySQL cluster nodes, and the MySQL Cluster Manager client provides a command-line interface to the agent's management functions. Agent. The MySQL Cluster Manager agent is comprised of the set of all MySQL Cluster Manager agent processes running on the hosts making up a given management site. A MySQL Cluster Manager agent process is a daemon process which runs on each host to be used in the cluster. In MySQL Cluster Manager, there is no single central server or process; all agents collaborate in managing a cluster as a whole. This means that any connected agent can be used to carry out tasks that effect the entire cluster. 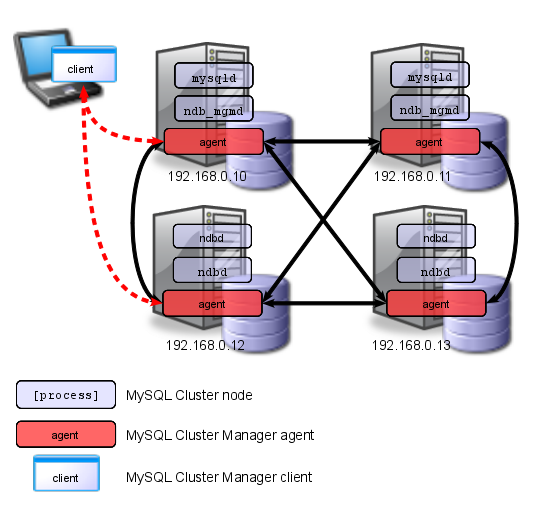 Each agent process is responsible for managing the MySQL Cluster nodes running on the host where the agent is located. MySQL Cluster management and SQL nodes are managed directly by the MySQL Cluster Manager agent; cluster data nodes are managed indirectly, using the cluster management nodes. Creating, performing initial configuration of, or starting a cluster, requires that agent processes be running on all cluster hosts. Once the cluster has been started, it continues to run even if one or more agent processes fail. However, any failed agent processes must be restarted before you can perform addition cluster management functions. Client. A MySQL Cluster Manager client is a software application used to access an MySQL Cluster Manager agent. In MySQL Cluster Manager, the client is actually nothing more than the mysql command-line client, started with the options that are necessary for it to connect to an MySQL Cluster Manager agent. MySQL Cluster Manager 1.1.6 and later releases include an mcm client for ease of use; this client consists of a script that acts as a wrapper for the mysql client with these options. In this example cluster, 2 of the hosts each house a management server and an SQL node; the other 2 hosts each house 2 data nodes. However, regardless of the distribution of cluster nodes among the hosts, a MySQL Cluster Manager agent process must be runnings on each host. A MySQL Cluster Manager client can be used to access the agent from any of the hosts making up the management site to which the cluster belongs. In addition, the client can be used on any computer that has a network connection to at least 1 of the hosts where an agent process is running. The computer where the client itself runs is not required to be one of these hosts. The client can connect to and use different agent processes on different hosts within the management site, at different times, to perform cluster management functions.